At 9:15 a.m. on February 22 nine members were called to Highway #20,just north of Highway #12 where a pickup truck had crossed the southbound lane, left the road and ended up in the west ditch, narrowly avoiding a power pole. The driver had self-extricated so BFD crews carefully controlled the morning traffic while the patient was examined by EMS. On March 3 at 7:16 P.M.twelve crews were sent to a vehicle fire on Rainy Creek Road. Some time was spent locating the vehicle, which turned out to be a snowmobile, as the fire had extinguished itself and the blackened frame was all that remained, half-buried in the ditch in the darkness. No driver was located in the area so the scene was turned over to the RCMP and the BFD was released. Shortly before 9 a.m. on March 5 several members were sent to the inter- section of Highway #12 and RR 2-2 west of Bentley where a southbound minivan and an eastbound semi with trailers had collided. Both drivers were safely out of their respective vehicles and miraculously the injuries were somewhat minor. EMS assessed both patients, neither of them required hospitalization. BFD managed the highway traffic then left the scene in the hands of the RCMP who were busily conducting their investigation. And on March 7 shortly after 8:30 a.m. a call was received of alarms ringing at the Bentley Care Centre. This was an accidental activation as the existing system had been replaced and was being tested. The alarm had been re-set and fire crews were informed and stood down. 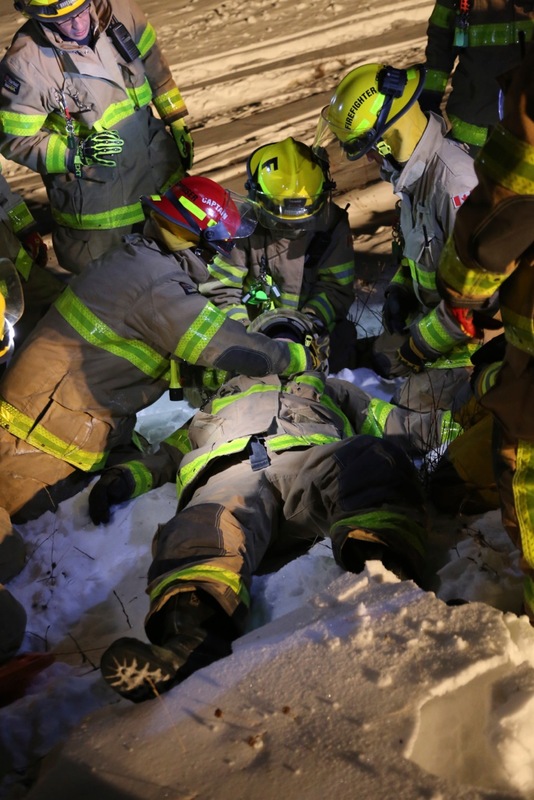 Your department has been working hard over this winter, with courses specializing in ice rescue as well as regular training every Monday night. Practice nights have included rescues in winter conditions using the Stokes basket, a type of "toboggan" which helps rescuers safely transport a patient up steep slopes in deep-snow conditions. This hands-on training can be hard work but is also a whole lot of fun!